For years, the Employee Free Choice Act had been a reliable legislative chestnut in Washington. Democrats routinely trot out the bill, which would make it easier for workers to unionize. Legislators, including some Republicans, would sign on as cosponsors and earn points with organized labor, easy enough to do when they all knew the bill didn't have a prayer of making it through both houses, let alone getting signed into law by a Republican president. This year, though, the situation has changed, opponents and proponents say. "The Democratic majorities make this a very different environment," said labor and political historian Joseph McCartin, an associate professor of history at Georgetown University in Washington. "Last year, it was more symbolic," he said. "This year, there are some real possibilities." Chief among those is the likelihood that the bill will pass the U.S. House with bipartisan support - including a majority of area legislators. No wonder both sides are working harder than ever to get their messages out. The nation's largest labor federation is holding dozens of events around the country similar to one sponsored by the AFL-CIO in Philadelphia last week. Local congressional representatives, including mayoral candidates Chaka Fattah and Robert A. Brady, listened to employees talk about the troubles they have when they try to unionize their workplaces. "The sooner they pass it, the better," Delores "Dee" Wilmer of Holland, a bartender at the Doubletree Club hotel in Northeast Philadelphia, told the legislators. Unite-Here Local 274, which is trying to organize food workers at the hotel, filed an unfair-labor-practice complaint on Wilmer's behalf, alleging that she was suspended on trumped-up charges Feb. 13 because she supported the union. She has since been reinstated. Besides a blizzard of statements and news releases, there are dueling polls about union popularity and organizing put out by the AFL-CIO and by the Center for Union Facts, which disparages "union bosses." A group called the Coalition for a Democratic Workplace has lined up a long list of opponents to the bill, including the U.S. Chamber of Commerce, the National Retail Federation, the National Association of Manufacturers, and the New Jersey Business and Industry Association. Even with all the activity, no one expects the Employee Free Choice bill to become law this year. President Bush has promised a veto, and the thin Democratic majority in the Senate is unlikely to muster the 60 votes necessary to overcome a likely GOP-backed filibuster. But a House victory is significant, McCartin, the associate professor of history, said. "In order to bring any heat to bear on the Senate, you have to get the bill through the House," he said. "In order to hold the Democratic presidential candidates' feet to the fire, you have to get it through the House. "Ultimately, this is preparation for the fight which is going on down the road," he said. "I believe the labor movement looks at this as a two-year project." Proponents of the act say it is needed to fix the National Labor Relations Board election system. In order to hold an election to unionize a company, a union must file a petition signed by 30 percent of the workers. Sometimes the company will challenge the number and type of workers in the group. Critics say such challenges delay the election and give the company more time to frighten workers with union-avoidance campaigns. Penalties for violating the law are so light that companies view them as a cost of doing business, union organizers say. At Wednesday's AFL-CIO event, Wilmer, her voice trembling, told the legislators that new, tougher managers were brought into Doubletree after the union drive began last fall. 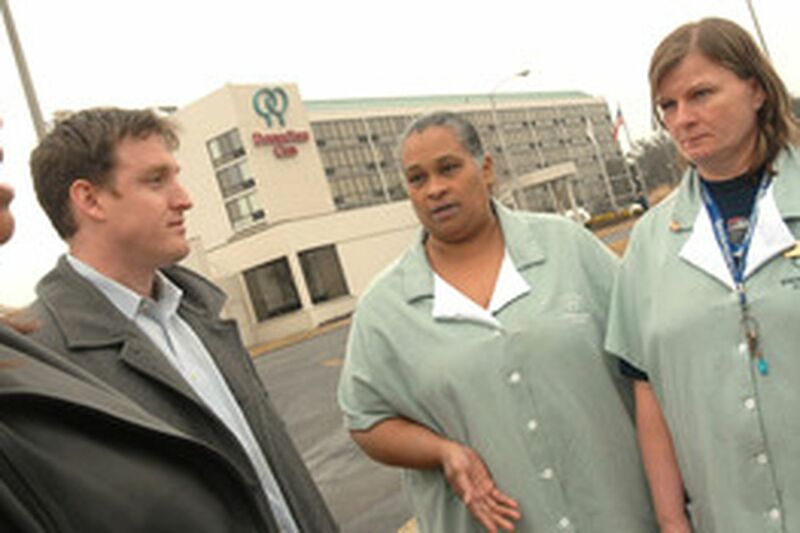 Workers had to attend meetings about unions even though the hotel's housekeeping staff is already represented by Local 274. The manager tore down signs for the election, Unite-Here organizer Michael Mullins said. Managers humiliated union supporters and supervised them more intensely, Wilmer said. "I'm the pinata at the hotel. I've been beaten, but I'm not going to let them win," said Wilmer, a part-time bartender for 13 years. According to Labor Board statistics, about half of all election petitions filed are withdrawn before an election. Unions will often withdraw if they lack the votes to win. Unions win slightly more than half of the elections that are held, according to the Labor Board. The Employee Free Choice Act would allow unions to represent workers if 51 percent of workers signed cards asking for union representation. Unite-Here said that 19 of 22 Doubletree hotel food-service employees signed cards for union representation in early October, two months before requesting an election from the Labor Board Dec. 18. If the act were law, the workers would already be in a union and would have finished negotiations on their first contract. Instead, the election was held Friday, and the union lost, 11-10. "I think it was lies. Lies and intimidation," Mullins said. "That's the usual combination." Hotel general manager Lisa Simpson said that she was pleased with the results and that her company followed Labor Board laws and guidelines. She would not comment on Wilmer's situation. "We believe a secret ballot is the best way to allow true free choice," Simpson said. Opponents of the Free Choice Act say the card method lets unions intimidate workers and subject them to peer pressure. The only protection against it, they say, is the Labor Board's time-honored secret-ballot election process. That's what clerk Pam Knappenberger sought last year when the United Food and Commercial Workers Local 1776 tried, after seven failed attempts, to unionize the Lehigh County-run Cedarbrook nursing home and annex near Allentown. County officials agreed not to contest union representation if a majority of the 580 secretaries, maintenance and housekeeping workers, nurses aides and therapists signed union authorization cards, as they did. But 129 workers, including Knappenberger, unsuccessfully petitioned the NLRB for an election instead. Knappenberger said some of her coworkers "were intimidated because of the pressure." She said they were urged to sign cards showing their interest in having an election. They were later told that the cards meant they wanted Local 1776. "It was very sneaky and unfair," she said. Ray Christman, a certified nursing assistant, disagreed. Complaining about harassment for his support of the union, he was among the workers who spoke to the legislators in Philadelphia on Wednesday. "Everything was legitimate," he said, adding that a priest, the president of DeSales University, supervised the count and that the cards specifically said that a signature authorized union representation by Local 1776. "Nobody asked for their cards back," he said. Allow a union to be certified as bargaining agent - without an election - if a majority of workers sign valid cards authorizing representation. Require companies and unions to negotiate first contracts within 90 days or face mediation and binding arbitration. Strengthen enforcement of the National Labor Relations Act.